Genuine off-road caravans have the ability to go-anywhere, so we explore all the parts and pieces that make them great! A true offroad caravan is purpose-built for off-the-grid life. Its prime brief is providing the intrepid traveller with peace of mind to free camp off the beaten track for extended periods. Ridgy-didge offroaders are geared for testing topography and extended stays in the bush. 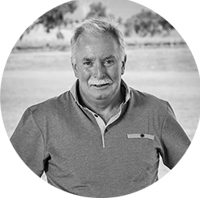 Quite simply, they are built for distant touring – read serious travel into arid regions. Genuine offroad caravans have the ability to ‘go-anywhere’. They are specifically constructed for sustaining punishment and going tete-a-tete with an unforgiving outback. All are homes-away-from-home designed for ultimate adventure and capable of trekking to uncharted territory. 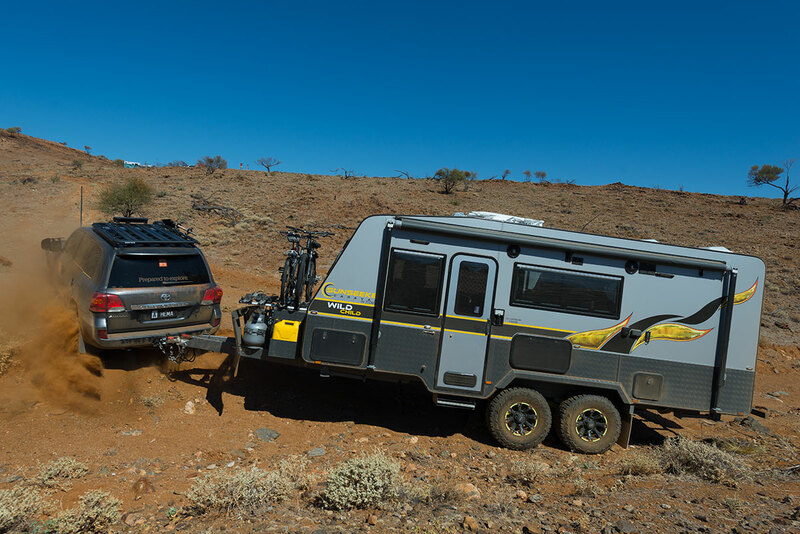 They’re built on rock solid foundations, for those intent on hitting the road to nowhere.The vast majority of capable offroad caravans comprise a ‘beefed-up’ chassis and frame, heavy-duty suspension, along with increased battery and solar capacities. Additionally, they usually carry grey water as part of their water storage capacity for far-flung expeditions. And with most offroaders, a huge emphasis is placed on coupling articulation, enhanced ground clearance, and a larger departure angle. Offroad caravans need robust suspension and any offroad van worth its salt will be fitted with a good offroad independent suspension system that will minimise the amount of ‘shock’ transfer from the terrain, whether it’s dirt roads or corrugations, severe undulations or potholes, through to the body of the caravan. Undoubtedly, independent suspension is a firm favourite with offroad caravan manufacturers, the favoured style being coil springs with trailing arms and shock absorbers, such as AL-KO Enduro Outback, which is designed specifically for offroad vans, or its Independent Rubber Suspension setup. So, with all of that in mind, what are the ‘essential ingredients’ of a bona fide offroader? A sturdy chassis, with well-protected members, is the paramount foundation of an offroader’s makeup. A chassis configuration conventionally built with a galvanised box section chassis that has 150x50mm (6in x 4in) RHS members for the A-frame and 100x50mm (4in x 2in) RHS for the chassis rails, and 75x50mm (3in x 2in) raisers. Some manufacturers also laminate (weld) a second rail to the first. This set-up increases strength and stability but also creates a weight increment. Subsequently, this has led to aluminium and hybrid (aluminium/steel) chassis designs. Aluminium frames are becoming increasingly popular. They provide great strength, considerable weight savings and resistance to water damage. 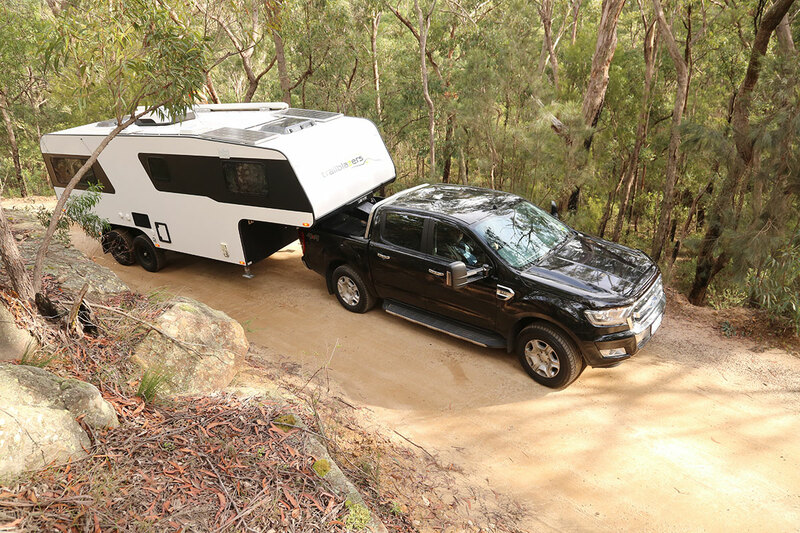 A myriad of offroad caravans comprise an upgraded suspension system, with high-grade springs and shock absorbers. And a suspension that provides ample clearance for navigating across the rough stuff. Any offroad caravan worth its salt will be fitted with a good offroad independent suspension system that will minimise the amount of ‘shock’ transfer from the terrain. 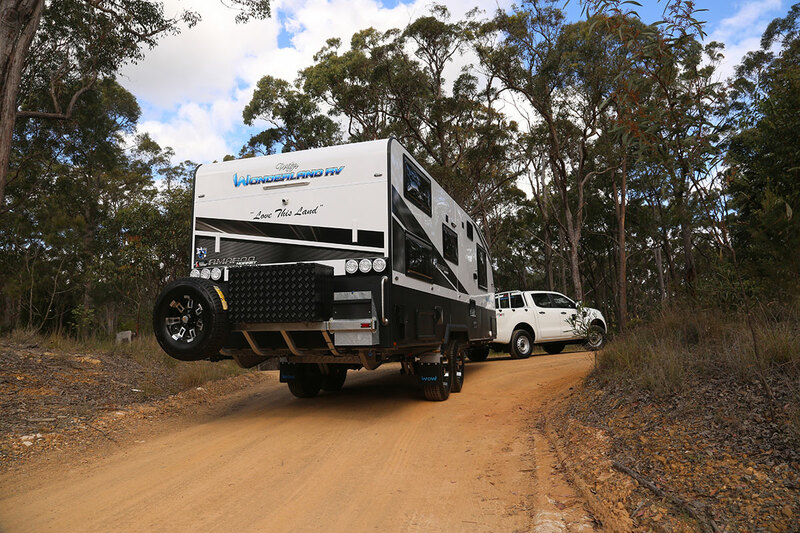 Undoubtedly independent suspension is a firm favourite with offroad caravan manufacturers, the favoured style being coil springs with trailing arms and shock absorbers, such as AL-KO Enduro Outback or its Independent Rubber Suspension. For anyone contemplating an offroad caravan, enhanced ground clearance is an imperative consideration. It’s not only minimum height off the ground that matters but also ensuring all vital components are strapped up out of the way. A larger rear departure angle is necessary so that the caravan can handle seriously undulating tracks without scraping the rear end. Larger wheels also provide increased ground clearance, while offroad tyres offer superior traction and better all-round performance. Increased battery, solar and water storage (including grey water) capacities are also essential for remote travel. Around 200Ah battery capacity, 300W of roof-mounted solar panels, and 190L of freshwater gives good remote camping ability. Several bona fide offroad vans even have an electrical configuration that comprises the likes of a 240Ah lithium battery, 450W of solar power and a 3000W inverter, and a water supply with three 95L tanks (including a grey water tank). Some manufacturers offer split systems so that drinking water can be kept separate from the main tanks. This gives the option of being able to fill the general-use water tanks from more sources, with less of a worry about water quality. Offroad water tanks are often poly moulded to give more strength and less need for protective shielding. Offroad couplings are essential for 360-degree articulation, and the AL-KO Offroad Ball Coupling is engineered specifically for extreme offroad adventure. It comprises extreme vertical and horizontal articulation as well as quick and easy hitching design that requires no pin or hole alignment. Standard ball couplings are sufficient for many caravans, but for those intended for offroad touring there a number of alternatives available that offer plenty of vertical and horizontal articulation. A good question to ask any manufacturer is precisely how the caravan’s body is built and how much testing is done. Points to note are how the frame is constructed (most serious offroad manufacturers happen to use aluminium), how the cabinetry is built (screws/glue/bonding), and how the body is attached to the chassis. 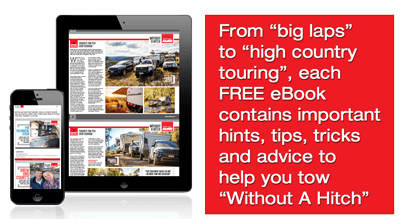 Different manufacturers use different methods and for those who build both on-road and offroad caravans, it’s essential to get an understanding of the difference – if there isn’t one, why not? A ‘no’ to that question is not necessarily the ‘wrong’ answer as quite a few specialists use the same technique whatever style of caravan they are building. Remember, weight ultimately limits where an offroad van can be taken. 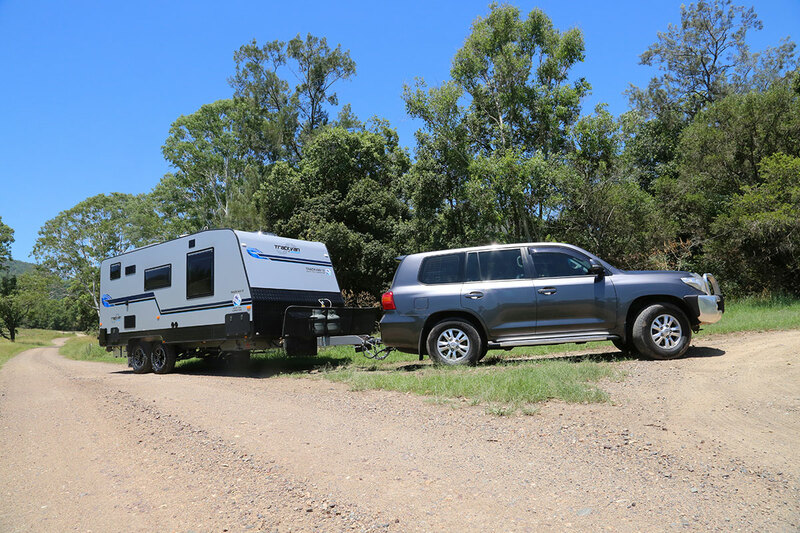 Purchasing an offroad caravan might sound like a great idea for exploring remote corners of Australia, but for the most part such a caravan will be heavier than one built for on-road use only. Therefore, it’s essential to have a tow vehicle that can haul that weight. It’s not silly to consider reality versus dreams but downsizing to a smaller, more manoeuvrable van might be an effective solution. 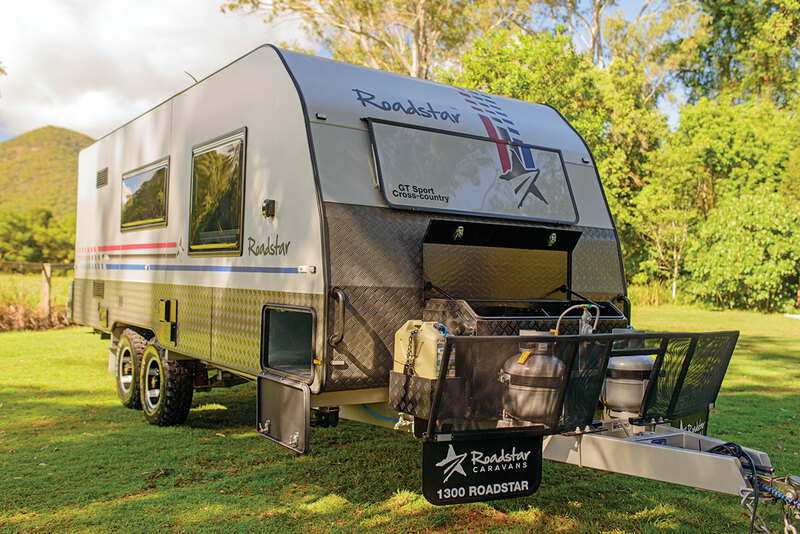 Additionally, there are a number of camper trailer manufacturers that have successfully made the transition to a ‘hybrid’ hard shell camper trailer. Often with a pop-top roof or extendable ends, these hybrids have genuine offroad-ability, have most of the comforts of a full-size caravan, and yet are considerably less weighty. So, in summing up, a true offroad van requires careful engineering and offroad specific componentry. It should also have the right stuff for would-be adventurers who want a touch of comfort while still having the ability to get out and enjoy the great outdoors. For starters, the quintessential offroader should have a very strong looking chassis complemented by a sharply raised rear end that gives a very good departure angle. It must feature battery, solar and water capacities, and a reputable BMS, that can be used off the grid for extended periods. And for those essential 240V items, the fitment of an inverter around 3000W. Yes, good power storage is of great importance in order to keep the milk, eggs and meat cool! Manoeuvrability is also integral, thus a narrower external width is some advantage if traversing narrow, winding tracks. Most high calibre offroaders also have purpose-cut one-piece walls and floor bolted to the chassis for rigidity purposes, a large front toolbox mounted on the drawbar, and additional external bin space provided by front tunnel storage. Retaining a dollop of internal luxury without compromising offroad-ability is equally crucial. Creature comforts and sophisticated styling with premium accessories, such as a tropical climate class three-way evaporative fridge/freezer, are life’s little luxuries out in the woop woops. And if red-track touring and nights camped under starry skies is your whim, then any offroader of ilk should have provision for al fresco cooking, such as a slide-out kitchen with cooktop and sink. And lastly, important miscellaneous items any offroader should carry are a decent payload (around 500-600kg), dust sealing, stone protection, and quality cabinetry hinges.